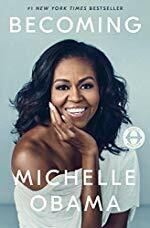 Becoming is the memoir of former United States First Lady Michelle Obama published in 2018. Described by the author as a deeply personal experience, the book talks about her roots and how she found her voice, as well as her time in the White House, her public health campaign, and her role as a mother. Held off from reading this until now as am going to see her book tour in Paris next week! I loved this book, really moving and fascinating.